I’ve said it many times before — I hate death. In fact, anyone that has breathed, I would guess, has said those words at least once… some years, more than once. A Christmas post on death may seem strange or out of place; I had a different one planned, in fact. Today, though, one phone call reminded me that death is still a thief at large in the world, and that it had stolen my adopted grandma, a spirited and godly British lady next door that I had the blessing of growing up knowing — her as a grandma to me, me as a granddaughter to her. Since this summer, it seems that death has stolen much from my family and the friends around us: a brother, an uncle, a husband, a friend, a father, a grandmother, a mother, a wife… four living testimonies to the grace of God. Just as I was mourning this latest news, the Holy Spirit prompted my heart with Christ’s promise in John 10:10. Yes, the thief only comes to steal, kill, and destroy, but Christ has come that we — that Papa Glen, Ross, Uncle Stevie, Grandma Daphne — might have life and have it abundantly. That’s why we have Christmas. The almighty as a baby. The righteous for the unrighteous. So that we may have life and have it abundantly. Christ was born to live perfectly, take my sin upon himself in death, and rise in victory, defeating death. Because without Christ, we have no hope for life. Without Christ there is only the expectation that Death will come to steal and keep forever those that it claims. But for those in Christ, what was true of Him is true of them: it is impossible for Death to keep its hold on them. Death cannot keep the Christian that it claims. Instead, Death must submit to God and act as a doorway to eternal life. Death cannot separate the believer from the love of Christ. Though it steals from us below, it cannot steal from the Good Shepherd. So even though I have been left behind for now, I know that my loved ones in Christ are not dead, but eternally alive. While I am celebrating the remembrance of the angels that sang over Bethlehem’s hills, they can hear the angels before the throne. While I am remembering Christ come as a baby, they can see Him as the risen King. While I see as through a mirror darkly, they can see face to face. While I am right to grieve down here, they are right in rejoicing with a joy exceeding that of the wise men. All because of the reality of Christmas. 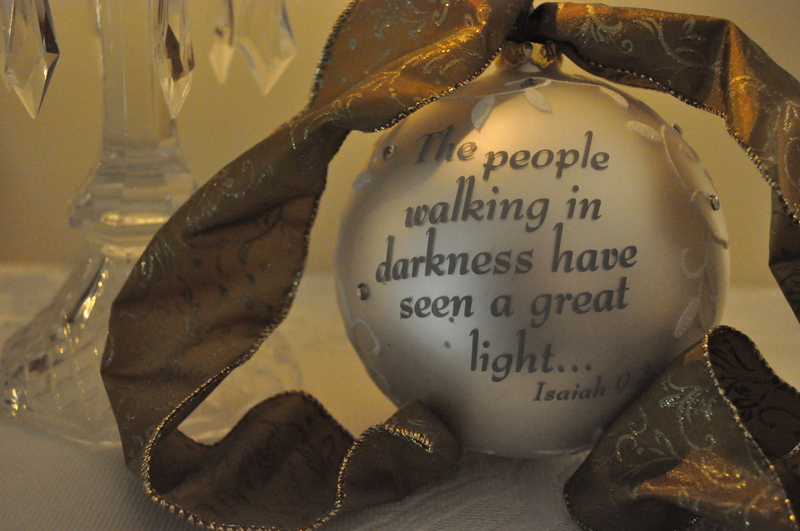 Posted on December 25, 2013 by Katie •	This entry was posted in Thoughts and tagged Christ, Christmas, death, hope, life. Bookmark the permalink.